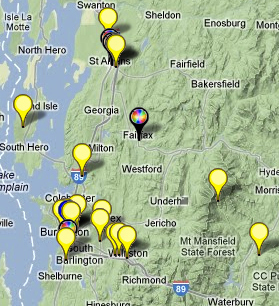 To view the atlas and Vermont's inventory of LID practices, click on the map. The National LID Atlas was created by UCONN's Center for Land Use Education and Research (CLEAR) to highlight innovative low impact development practices around the country. Its goal is to encourage and educate local officials and others about low impact development practices by providing specific, local examples of their use. Projects can then be filtered by state, type (Swale/Bioswale, Bioretention/Rain Garden, etc.) or land use type (Civic/Public, Commercial, Green Streets, etc.) using the vertical menu bar to the left of the map. View details of each project by clicking on the color-coded icon.